While most of the UK’s population is sleeping, Roger is riding his Honda bike with a precious cargo on-board. He is delivering blood to hospitals in the surrounding areas. A volunteer with the charity SERV, he uses his own free time and resources to give something back to the community. 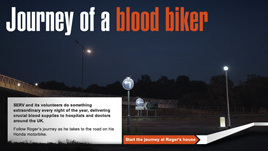 The charity SERV (Service by Emergency Rider Volunteers) delivers emergency blood, medical equipment and drugs at night to local hospitals safely, quickly and reliably.